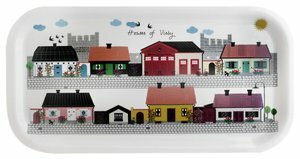 Webshop - Gotlands Museum - Tray " Houses of Visby"
Home » Themes & Design » Houses of Visby » Tray " Houses of Visby"
Tray " Houses of Visby"
Visby is a magnificent medieval town, which has been added to UNESCO's list of World Heritage Sites. Visby must have been a magnificent sight with tall, plastered buildings and monumental stone churches. In other parts of Visby you will find houses from the 18th century with small post-and-plank buildings of timber and beautiful rose bushes. The famous Pippi Longstocking-films were shot on location in Visby in the 1960s. Size: 43,5 x 22,5 cm.